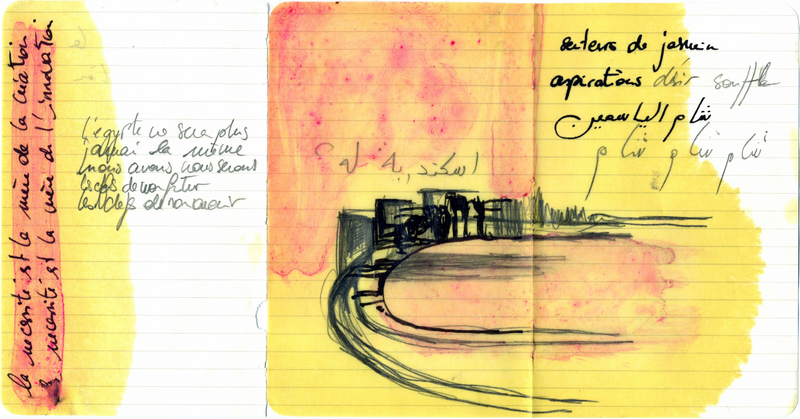 the Alexandrian proposal of the project during Spring 2011. The approach of Moutawassat project is to invite artists in residencies in the Mediterranean region, within a specific timeframe, allowing them to take over locations using their artistic practice. The artistic residencies are a time for research, to co-exist, cohabit with, and confront the Mediterranean reality. Moutawassat project is based on the idea of inviting artists in residency programs in Mediterranean territories, within a specific timeframe in which they will use and develop their own artistic practice. The residencies are a time where the artists will put themselves in relation with the Mediterranean territory they are working in. On the first two years, the project took place on a 9 meters long ship, exploring sea environments such as ports, shipyards, or islands. In Alexandria, it seemed relevant to build our proposal around areas which are close to the seaside. We chose to have the various artistic residencies taking place on a path starting from the Plaza of the Alexandria Library towards the shipyard at the Anfoushi area. With 4 residencies with 4 choreographers in 4 locations within the city, the project goes through very different environments: different social and cultural areas, different communities, different lifestyles, ways of living, but with all in common the fact that they are close to the sea side.